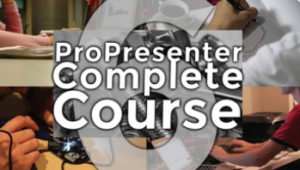 Our friend Paul Alan Clifford’s Online Course Library for ProPresenter. Learn how to use Renewed Vision’s ProPresenter software from the basics to advanced techniques. Paul offers these courses for extremely affordable prices for you and your team. Our friends at MediaShout created a simple program to use, however, they understand that learning a new program can be overwhelming at times. This is why they moved all our training online into easy to follow short video segments. Simply choose the category and the topic you want to learn about. Canva’s Design School has everything you need to learn design. Check out their daily design articles, interactive tutorials and awesome tips. A great library of video courses, cheat sheets, templates and formulas to help you learn creative skills and get your church noticed. Expand your creative potential with SALT University by joining the hundreds of churches around the world that use this incredible learning resource. With over 100 hours of in-depth, practical and relatable training on topics like Filmmaking, IMAG, Graphic Design, Stage Set Design, Lighting and more!